Prepare yourself for the ultimate luxury car rental in Los Angeles. The Maybach rental is the most luxurious sedan in the Mercedes-Benz fleet. A vehicle that combines a comfortable ride, powerful engine, and the latest in German automotive technologies. At first glance, the S600 might just seem like a beefed up S550 but the s600 Maybach is actually quite different. For starters, the S600 has a lengthened wheelbase which provides much more room for passengers. Other subtle refinements can be found around the Mercedes-Maybach including chrome detailing in the front and elegant new wheels. When you rent a Maybach in Beverly Hills you’re getting behind the wheel of a luxury sedan that has years of German engineering in every part. Step inside the Maybach and you’ll be greeted with a unique comfort control system that can rejuvenate your senses and relax your body using a variety of features such as a fragrance system, ambient lighting, a high-end audio system, and massage seats that can be cooled or heated. In the rear, the executive seats are diamond-quilted, button-tufted in exclusive Nappa leather. The technology inside the Maybach S600 begins with dual widescreen panels. The central display allows you to control the entertainment system, navigation, and 64-color ambient lighting. The media system is also equipped with Apple CarPlay™ and Android Auto providing better integration with your cell phone so you can keep your eyes on the road. A combination of radar, camera and navigation technologies allow the S600 to brake for traffic and allow you to change lanes with a tap of your finger. Combined with the LED headlamps it provides bright illumination of the road making this one of the safest Mercedes-Benz rentals in Los Angeles. Are you ready to rent a Maybach s600 in Los Angeles? We can deliver this hyper-luxurious sedan to you anywhere in LA including Beverly Hills, Malibu, Beverly Park, Redondo Beach, Manhattan Beach, Hidden Hills, Rolling Hills, Bel-Air Estates, Upper Laurel Canyon, Palos Verdes Estates, West Hollywood, Brentwood Park or even Los Angeles Airport (LAX). 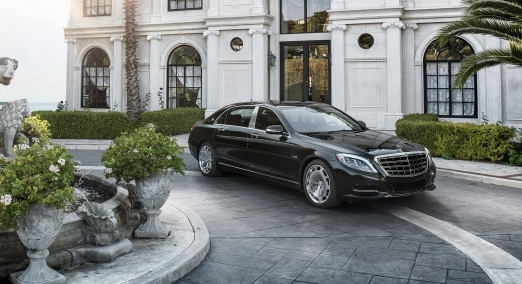 Travel in style on your next vacation to LA with a Maybach S600 rental car. The price to rent the Maybach S600 in LA can fluctuate during holidays and based on seasonal demand. The cost to rent a Maybach S600 usually varies between $749-$899 per day. The car does not come with a driver but if you need a driver then you can try our chauffeur services in Beverly Hills. If you already have a vehicle with insurance then you wont have to pay extra. There is a $5,000 security deposit required that can be left on a credit or debit card. In Beverly Hills, international drivers are required to pay an additional fee for insurance along with a higher security deposit.